Don’t mind me over here wiping the umami splatters off my computer screen as that’s how it should be. 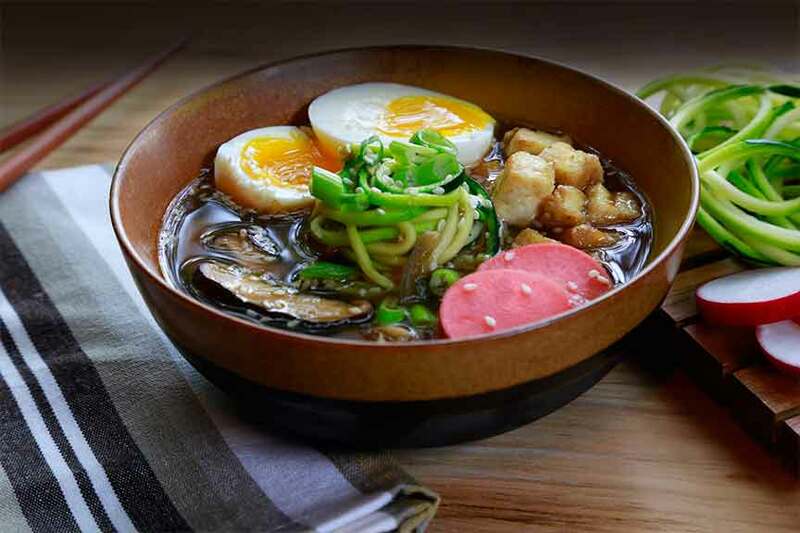 This Zoodle Ramen, like any ramen, is made to be eaten in slurpy happiness. And that’s what it was all about… creating a lighter version of something that I love to eat. Packing it with not only big flavor, but lots of veggies. Don’t have a spiralizer? No sweat… lots of grocery stores sell zucchini noodles – or zoodles – packaged in their produce sections. Now my Midwestern husband will be the first to proclaim that zoodles are not noodles much in the same way he looked at my cauliflower “rice” with a skeptical eye. But despite his initial reactions, he concedes that they taste good as long as we’re both clear that I’m not fooling him with my switch-hitter foods. You could easily add leftover cooked chicken or pork or beef just as you could use those kind of stocks too but for mine, I’m keeping it vegetarian with veggie stock and tofu lightly coated in cornstarch so that it turns out golden and crispy (it’s all I can do not to eat all of it straight from the pan while I’m working on the other components). One of my favorite parts of ramen is the soft, seven-minute egg so that was a given and I love the acidic crunch of the quick pickled radishes. It rounds out the salty and spicy flavors and adds another texture. And speaking of which, don’t let your zoodles get soggy. Throw them into their broth-y hot tub at the last minute and heat up just to the point of being al dente. A sprinkling of sesame seeds and green onions with a big squeeze of Siracha and I’m one happy girl. Now where was I? Oh yeah. Drain the tofu and cut block horizontally into 4 long planks. Place planks flat on several layers of folded paper towel, topped with several more sheets. Top with a cutting board and then add add something heavy (I use a stack of plates). Put the radish slices in a bowl and cover with rice wine vinegar. Meanwhile heat sesame oil over medium high heat in the bottom of a medium sized saucepan and add onion and mushrooms. Cook until the onions start to soften. Add white parts of scallions, ginger and garlic and heat until fragrant – a minute or so. Add stock and soy sauce and reduce heat to a simmer. In a second sauce pan heat several inches of water (enough to fully cover eggs) to a boil. Using a slotted spoon, lower eggs into boiling water. Set timer for 7 minutes. When timer sounds immediately plunge then into a bowl of ice water. Cut drained tofu into cube and toss to coat with cornstarch. Coat a nonstick fry pan with cooking spray and add tofu, cooking and turning until golden. Add zoodles to broth just long enough to heat them up. You still want them al dente. Divide the zoodles and broth among 4 bowls and top with crispy tofu. Peel eggs, cut in half and add one to each bowl. Garnish with the pickled radishes, green onions and sesame sides. Serve hot sauce on the side.